The Zero Pressure Zone is the area between the shoulder and the back, known in pa kua as the dead zone, where you are able to control the opponents movement with very little physical effort. To learn how to control the Zero Pressure Zone place one hand on the side of your partners shoulder and one hand on their back. Have them push against you. You will find that they can generally push in one direction and that in other directions they will have no power or Zero Pressure. You control and push them in the direction where they have no power / Zero Pressure. Have your partner push into the direction where they feel you are controlling them from. Then when you check you will feel that there is still an area of Zero Pressure but that now it is in a different direction or position than before. This is because when they place emphasis in a different direction then the Zero Pressure Zone simply changes to somewhere where they are not putting force or emphasis. You can play this game continuously. The hardest part of the game is to push into Zero Pressure. Most people want to push where they feel force and pressure. This is because then you feel like you are fighting something. To push into Zero Pressure feels strange at first because you feel like you are fighting against “nothing”. People appropriately tend to think that when you push into nothing that nothing will happen. When you push on Zero Pressure you are simply pushing where the opponent does not place any emphasis and so you move their body even though you do not feel much force or emphasis fighting against you. This is part of the reason that Zero Pressure is so effective. Generally, Zero Pressure is used so that you do not have to unduly harm the person you are using Zero Pressure on. This is an excellent bouncer technique and also a good technique to use in a multiple attacker situation so that you can control one attacker who is between you and the other attackers. 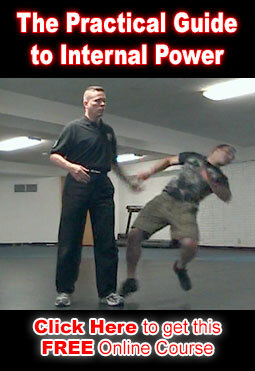 I will write more about the keys to effectively using Zero Pressure in a fighting situation in my next post.